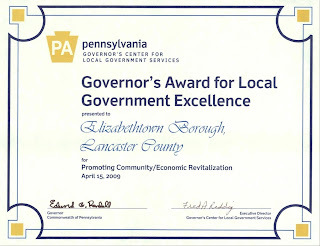 Elizabethtown recently won a 2009 Governor's Award for Local Government Excellence for the public-private partnership between the borough and Mars Snackfood US to extend West College Avenue and the $70 million expansion of the chocolate factory's manufacturing plant. The borough picked up the award at the 13th annual Governor's Award ceremony April 15 at the Farm Show Complex and Expo Center in Harrisburg. Elizabethtown was one of 11 government entities from across the state to be recognized for their foward-thinking approaches to revitalize towns, create jobs and improve the quality of life for residents. To maintain a major employer in the borough and secure the most-productive use of a large, low-impact industrial facility in downtown Elizabethtown for generations to come. To create a new entrance to downtown Elizabethtown and a "second square" that serves as a conduit to Mars Snackfood US, Elizabethtown College and Masonic Village. This project is one of the most significant for Elizabethtown in recent memory, especially given that Mars' main competitor nearby announced last year that it is moving chocolate manufacturing out of the United States. For a major corporation to make such a significant investment in this community is a boon to our tax base and our efforts to boost the local economy. As noted in other posts, the second phase of the West College Avenue project, which will include the construction of a bridge and connect with Market Street, is on target to go out for bids this summer. When that is complete, and the renovations of the Amtrak train station are done, expect Elizabethtown to become a force to be reckoned with in western Lancaster County.